Anjo Cerdeña, a reader of this blog, found a new interface for Google Alerts when opening the site. It uses Material Design and it has a few new features: a "me on the web" section and a list of suggestions for companies, people. countries, places, industries and more. It also shows your alerts and a simple box for creating a new alert. I don't see the new Google Alerts UI, so it's probably still tested by Google. I expect to see more and more Material-inspired design refreshes. The classic Google Alerts homepage is only focused on creating new alerts and it shows a lot of advanced options, as well as some information about Google Alerts. 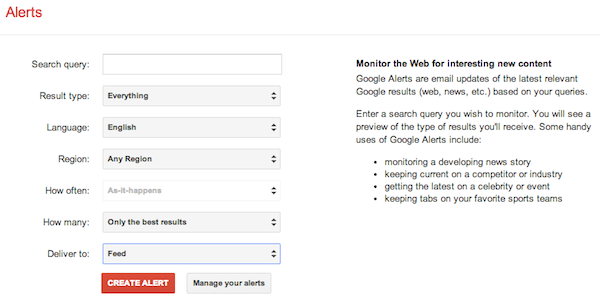 To see your alerts, you need to click "manage your alerts".